Two Bibliomaniacs: Top 10 Best Books Never Before Highlighted During Top 10 Tuesday! Top 10 Best Books Never Before Highlighted During Top 10 Tuesday! 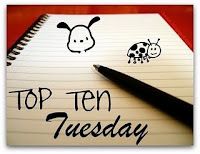 Question: Top 10 Best Books Never Before Highlighted During Top 10 Tuesday! Answer: For this week’s “Freebie” we decided to take a slight turn to the right. We pride ourselves in reading a variety of books, yet sometimes feel the same books keep appearing on our Top 10 lists. Soooo, for this week only, our list will include books never before highlighted during a previous Top 10 Tuesday. Our heavily funded research department uncovered some pretty interesting facts. Over the past 8-ish months we’ve highlighted a total of 110 different books during these always memorable Tuesdays. The leader board includes: Harry Potter series (17 times), Gone with the Wind (15 times), To Kill a Mockingbird (14 times), Pride and Prejudice (11 times), and I Capture the Castle (11 times). We were just as surprised to find that The Eyre Affair wasn’t closer to the top??? Something Wicked this Way Comes (Ray Bradbury) – Seriously good Ray Bradbury, or should we say Wicked Good Ray Bradbury (phrase best used in conjunction with a heavy Boston accent). With characters like Monsieur Guillotine and Mr. Electrico this novel is well worth your time. Pippi Longstocking (Astrid Lindgren) – We must highlight this novel for no other reason than our 6 year old son laughed hysterically when Pippi had to self-punish herself for not going to bed on time. Great children’s novel! I am a Genius of Unspeakable Evil and I Want to be your Class President (Josh Lieb) – Not quite sure how this book didn’t make it onto some kind of past 10 ten list. Quite funny and only mildly depressing. The Curious Incident of the Dog in the Night-Time (Mark Haddon) – This is another very original book with plenty to offer a perspective reader (a little heavy on the language for those who might need to cover their literary ears). The Woman in White (Wilkie Collins) – For anyone interested in the classics, this is one of the best mysteries for your money. Plenty of intrigue with a very interesting narrative and some great bad guys thrown in for good measure. The Haunting of Hill House (Shirley Jackson) – A great haunted house story that will give you the creeps without being too dark. Watch-out for that tree! Starship Troopers (Robert Heinlein) – For anyone interested in some good old fashion Sci-fi, this one should do the trick. A little heavy (okay, a lot heavy) on the military tactical side, but overall an interesting read. A Wrinkle in Time (Madeleine L’Engle) – Whenever we think of this book it brings a good-humored smile to our face. Chances are it will do the same thing to your face. The Secret Life of Bees (Sue Monk Kidd) – The high quality of this book is no secret, or at least if shouldn’t bee. I'm glad to know I'm not the only one that "recycles" books for Top Ten Tuesday. I feel like I talk about the same books over and over! Great idea for a list. I loved The Secret Life of Bees. Great list. I loved The Secret Life of Bees. I am a Genius of Unspeakable Evil and I Want to be your Class President sounds great! I loved THE EYRE AFFAIR, well, I love all of Jasper Fforde's books and they're always making some sort of list in my neck of the woods. PIPPI LONGSTOCKING was a transformative book for me when I was a kid. Loved it. I'm always recommending it. I used to love Pippi Longstockings as a kid. I tried her on my daughters and they never caught on to her silliness. I thought it was a generational thing so I'm glad to hear that you son loved her. I used to tell everyone how much I loved The Secret Life of Bees until the movie came out. It always seems that movies wreck good books or make people not want to read them anymore. "The Secret Life of Bees" and "The Haunting of Hill House" definitely deserve some recognition! This is a wonderful list! It's been years since I read A Wrinkle In Time, but I remember loving it! This list is a stroke of pure genius. I love it! Here’s my Top Ten Tuesday Freebie! Great list idea! Sometimes I feel like I highlight the same books over and over. :) I've been meaning to read Genius of Unspeakable Evil. Good to know it's good. I hear The Secret Life of Bees is fantastic! Great idea for the freebie!